BrightLine Eating, Getting Sugar Out of My Life, Can I Do It? – What's for dinner, Doc? BrightLine Eating, Getting Sugar Out of My Life, Can I Do It? Talk about a lazy blogger…. that’s me. I obviously cook and eat healthy food every day but most meals are just fuel, not necessarily worth writing about. That’s real life, right? I lost about 4 pounds without even getting serious about following the plan strictly. I kept a lot of the South Beach diet concepts; more protein, more veggies, less carbohydrates, limited alcohol, but I gradually let sugar and flour creep back into my life. Grrrr, these white powders can be as addictive as cocaine. I can do better. Alcohol free and loving it! I’m happy to say that I have kept alcohol out of my diet which has been a blessing. I have less pain and inflammation without a doubt. I read This Naked Mind by Annie Grace and there’s lots of great science explaining why alcohol is terrible for our health and brains. Abstinence isn’t for everyone but boy do I feel great without alcohol. By not drinking at all, there’s no big daily decisions. How much, how often, how many calories, how am I going to feel the next day? Blah, blah, blah. It was easy for me to just quit completely after I read the science. You can find her book at Amazon or at her website. I also like Kate Bee’s blog at The Sober School. She has terrific perspective on alcohol use and abuse. You don’t have to be an alcoholic to limit or stop drinking. That’s old wisdom and frankly many people could reduce alcohol consumption for the health benefits. There’s no shame in alcohol free living. I’m on a mission to kick the sugar. Sugar effects the brain much like alcohol and other drugs. We love it, we crave it and we continue to eat it without even enjoying it. At least that’s my experience. I feel like I have a hangover when I binge on sugar, that isn’t good. Your pancreas makes your insulin levels rise to compensate for the sugar bath, which can lead to diabetes and obesity. Your brain down regulates your ability to feel full and reduces your feel good hormones. WHAT? Sugar makes you more hungry and less happy! The data is compelling that simple sugars are driving the bus and derailing our efforts towards optimal health. The BrightLine Eating system by Susan Peirce Thompson, PhD works by taking away the daily decisions about food, supporting total abstinence from sugar and flours, giving you plenty of food to eat in 3 meals every day and makes you plan and commit to your eating plan. She suggests meditation and journaling to increase your foundation for success. It’s radical and regimented but I’m willing to try it to get me closer to my best healthiest weight and to get sugar out of my life. You can buy the book at Amazon for all the details. The details are proprietary so I’ve only given you the basic meal plan. For the full benefits and the science behind it I encourage you to buy the book or read her website. 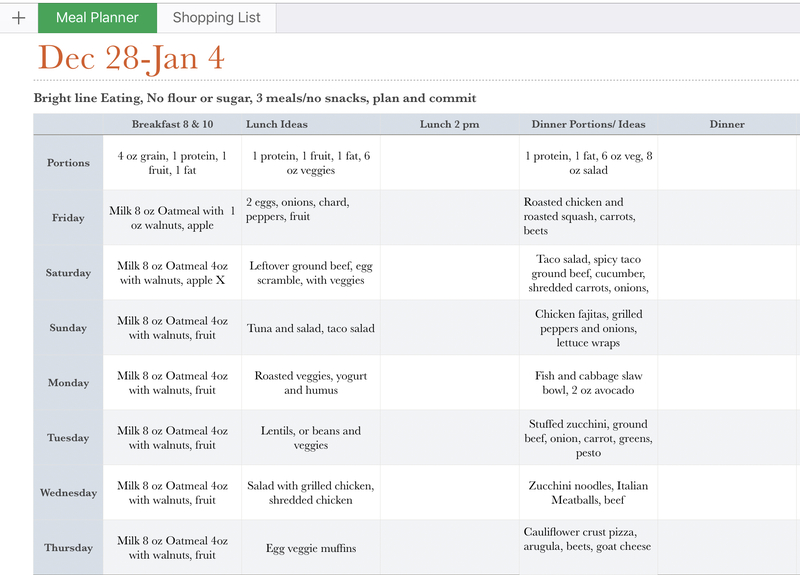 Here’s my meal planning tool with suggestions for lunch and dinner. Modify as needed and weigh and measure portions. I eat the same breakfast every day so I didn’t write out any alternatives but you can modify any meal. I eat oatmeal, walnuts and an apple. My protein comes from milk in my coffee or yogurt. My plan is using foods that are readily available in Baja. The plan recommends simple, automated meals so that will be a challenge for me, because, “hello, I’m a food blogger.” They also recommend not exercising in the early days of the plan but I’ll keep exercising 4-5 days each week because that’s on auto pilot for me. I usually eat 2 meals a day so I’ll need to work on getting 3 a day. I need to clean out my pantry ASAP of the sugar and flour snacks. I’m not going to lie, weighing all of my food could make me insane but others say that it gives them freedom. We shall see. My workout schedule includes yoga and water aerobics. 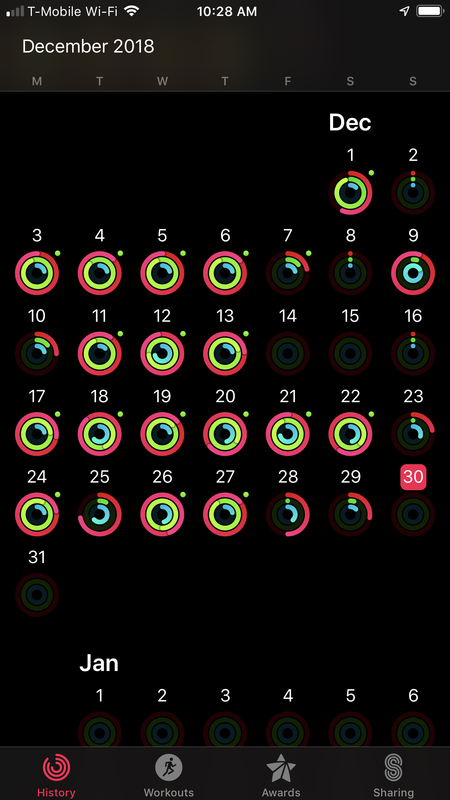 Here’s my Apple Watch data for December. Red circles are movement goals and green circles are exercise goals. I’m pretty proud of this but exercise doesn’t really help you lose weight, it’s all about the food. Long post getting longer. Here’s a few photos from a recent relaxing weekend on the Sea of Cortez. Yes, I wish I lived in this amazing house. No, I’m not a billionaire. Yes, that’s my adorable dog and side kick, Biscuit.